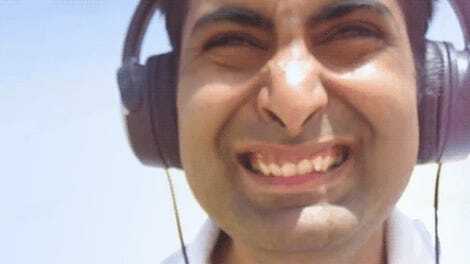 People who have “experimented” with LSD know that its mind-altering effects can last upwards of 18 to 24 hours, which is unusual for a hallucinogenic drug. After nearly 30 years of research, scientists have finally mapped the physical structure of this fascinating molecule, revealing why it tends to linger in the brain. New research published in the science journal Cell shows that the unique shape of lysergic acid diethylamide (LSD) allows it to fit snugly within serotonin receptors, and in a way that locks it in for an extended period of time. This may explain why its effects last so long even though the doses are so small, and why the hallucinogenic drug is so potent. Importantly, these insights could inspire the development of novel therapeutics to treat conditions such as anxiety and chronic headaches. Ever since Swiss chemist Albert Hofmann accidentally synthesized LSD in 1938, scientists have wondered how the drug works in the brain, and why its potent effects can last as long as 18 to 24 hours. To understand why acid trips last so long, scientists like Roth have been trying to decode its physical structure for decades. With the help of his colleagues at North Carolina Health Care, Roth has become the first scientist to finally do it, forging a picture of the drug as it attaches to a human serotonin receptor. Roth used a technique known as x-ray crystallography to “freeze” LSD while it’s still clinging to the brain’s serotonin receptors (which are located on the cell membranes of nerve cells), allowing his team to capture and analyze direct images. To create this atomic-scale snapshot, the researchers dissolved the receptors in water, then slowly took the water away. Using a series of experimental tricks, they continued to pull the water away and “convince” the molecules to sit still, making them crystallize. “It’s sort of like letting soup sit out overnight,” explained study co-author Daniel Wacker. “You’ll notice salt crystals at the bottom. That’s because the salt in the soup is dissolved in water, but then as water slowly evaporated over time, salt molecules latch onto each other to stay stable. The result: crystals.” Wacker makes it sound simple, but scientists have been trying to crystalize LSD since the 1990s. LSD, like the serotonin neurotransmitter, is capable of latching onto all serotonin receptor types, of which there are about a dozen. Looking at the arrangement, the researchers noticed that the LSD molecules were wedged into the serotonin receptor’s binding pocket at an unexpected angle. What’s more, a section of the receptor folded over, sealing the drug inside. It’s as if the molecule had drifted into an oddly shaped box, and became trapped inside when the lid came down. “Once LSD gets in the receptor, a lid comes over the LSD, so it’s basically trapped in the receptor and can’t get out,” said Roth. “LSD takes a really long time to get on the receptor, and then once it gets on, it doesn’t get off,” he added. At least not for a long time. As this study suggests, serotonin receptors play an important role in mediating the role of LSD, and the synthetic drug is probably activating the receptor, triggering many of the mind-altering effects associated with an acid trip (serotonin itself is responsible for feelings of well-being and happiness). Prior to this study, this effect wasn’t entirely clear. Interestingly, serotonin doesn’t react to its brain receptors in the same way that LSD does. LSD is pretty much doing its own thing in the brain, hence the big difference between an acid trip and biting into a piece of chocolate. The distinctive configuration of the LSD molecule appears to be driving its long-lasting effects once it latches on to the receptor. At room temperature, the drug exhibits an extraordinary slow rate of dissociation—on the order of about five hours. According to Roth, the longer LSD is exposed to the receptor, the more potent the drug becomes. This may explain LSD’s profound impacts on perception, consciousness, and awareness, as well as enigmatic data about the potency of this drug. Dosages of LSD are quite small, usually no more than 100 micrograms, and its effects linger long after the drug has been flushed away from the bloodstream (usually after about two hours). Eventually, however, all good (or bad) trips must come to an end. 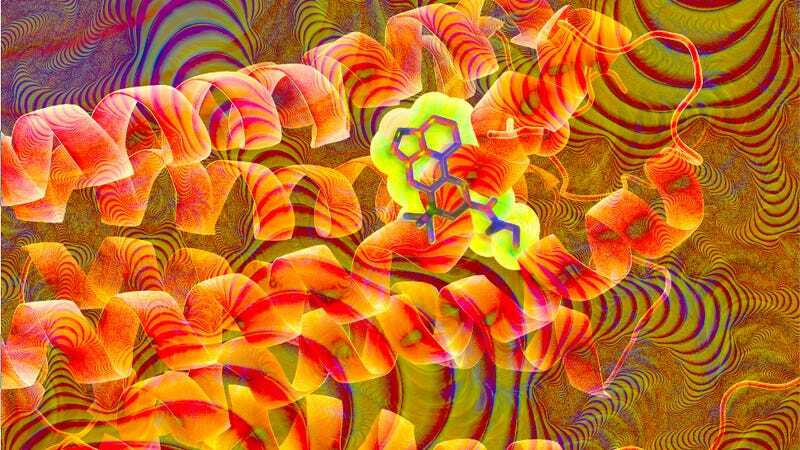 The LSD molecules eventually pop off their receptors as the receptor’s “lid” moves around. At the same time, the brain responds to the strange, foreign substance by drawing the receptor and the LSD molecule deeper into the cell. Excitingly, Roth believes that his team’s findings could translate to better medicines. They’re currently exploring the use of LSD for various medical and psychological conditions, such as cluster headaches, depression, anxiety, and PTSD. “It would be great,” he says, “if we could find a way to [take] the psychedelic actions and use them as therapeutic actions.” Given the big effects of relatively small doses of LSD, Roth would like to explore the impacts of “micro-dosing” where even smaller amounts of the drug are ingested. This would prevent patients from having to experience the hallucinations, while allowing researchers to study potential therapeutic purposes.